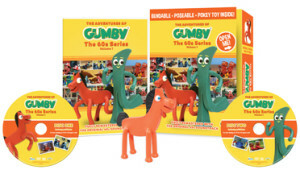 The Adventures of Gumby, 1960s, Volume 1 gift set just released on February 23, 2016. This set includes over 40 episodes from the early ‘60s, and a ’60’s style 4.5” bendable Pokey toy. It’s available at Gumby.com and major retailers such as Target, WalMart, Best Buy, Sam’s Club, Barnes and Noble, groceries and many more. Joe Clokey, son of Art and Ruth Clokey, the creators of the Gumby, found the original camera film rolls in the archives, and he has lovingly restored them. The film held up beautifully over the decades; the episodes look as though they were just created. The episodes are shown in their original lengths with the original soundtracks. The DVD includes some great bonus features, including the charming first pilot (with sound) that aired on NBC in which Gumby sings an entertaining song about himself. Other special features include: Space Ball, a rare episode that first introduced Professor Kapp; a tour of the 1964 Clokey Productions studio; and a special behind-the-scenes photo gallery. Volume 2 of the 1960s will be released in the fall of 2016. Following that, NCircle Entertainment will be releasing The Gumby Movie (1990s), re-mastered in its full length. The 80’s series will launch after that. A favorite iconic character of the past six decades, Gumby brings back fond memories for fans of all ages, while their children and grandchildren are mesmerized by Gumby on YouTube, Kabillion (a free on-demand network) and many other Internet based platforms. Gumby, the world’s original clayboy is truly timeless. His limitless adventures enchant each new generation. Get your DVD set here.